Another restless evening, in the middle of the typical Bangalore traffic, yawning, wondering about life. And a sudden sigh, when I realising how quickly these two months of the year have gone by. Although, this wasn't one of those What-Am-I-doing-With-My-Life sigh, it was rather a satisfied one. I can happily admit that last 3 months, have been splendid. Witnessing some of the most brilliant artists from across the world and various genres of music, at some of the most friendly venues and gigs. That only makes happy sigh. Talking about Drum and Bass in particular, I remember how I gawked at the gorgeous performance by Nero a few years ago. And after innumerable memorable gigs by homegrown and international acts around the country, December ’16 was again super lit, since Marky landed in our country, along with a bunch of acts that I would give up my sleep for, to say the least. And now couldn’t be happier as we enter March. Reason? Some of you’ve heard it, some of you haven’t. 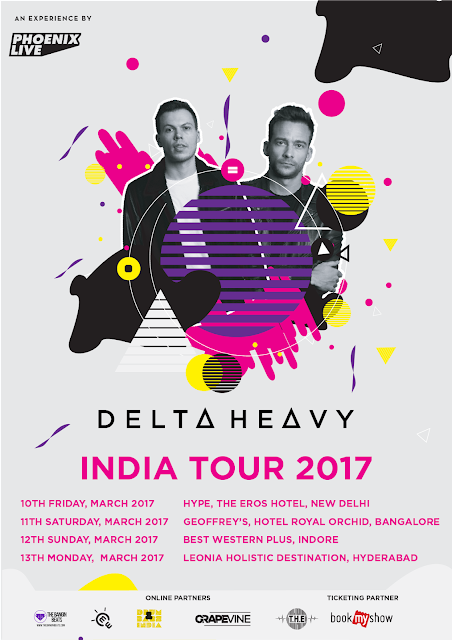 Delta Heavy are coming to India. Oh yes, The Delta Heavy. The duo that has been compared to the levels of the legendary names of the DnB scene like ‘Chase & Status’, ‘Nero’ etc. Ben Hall and Simon James, started together in the year of 2009, and since then there's has been no looking back. After a number of singles, EPs, and remixes, they finally dropped their very first LP in the month of March last year, with nobody else but the DnB beast 'Ram Records'. Give it a listen here. The all India tour has been put in place by Phoenix Live. The tour spread over four days, i.e. 10th to 13th March, is taking place in Delhi, Bangalore, Indore and Hyderabad. A sweet Holi treat for the Bass heads, ain't it! The duo will be supported by some of the most talented artists in the country, namely, Sound Avtar, Seven and Seven, Alpha and Omega, and our very own The Untitled One. So, get ready, prepare yourselves for some fine music ranging from 110-174 bmp [just to give you an idea] this Holi in India. Don’t be lazy, show some love, be a part of the experience, have a stupendous time, and be nice. Thanks to the staff at this place for making our event so enjoyable and if I ever get married. I know where to go! Great job all of you. Price was not too bad, considering the quality of food and beverages. Everything at this venue NYC was excellent. Personally, I have not had good experiences with tour operators. However, this has not been the case with the Green Vietnam visa. Terrified to give them a try, I did it nonetheless and for sure, it was the best thing to happen to me while I was there!